A little over a year ago, BlackBerry made up 90% of smartphone sales at Verizon. Now? They've dropped down to less than 20% with Android taking over the rest. It's crazy. 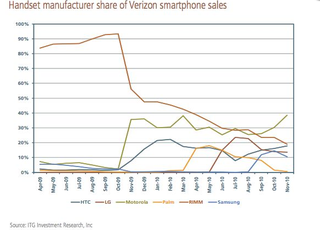 In the chart from ITG Investment Research, you can correlate the date of when each manufacturer boosted its share with a specific device: Motorola with the original Droid, HTC with the Eris and Incredible, Samsung with the Fascinate, etc. Contrast that with BlackBerry where any new release just continues this embarrassing downward trend. Can You Figure Out WTF RIM&apos;s CEO Is Talking About?